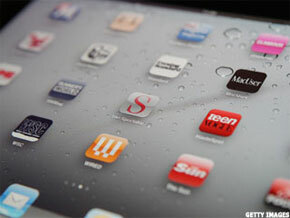 Small-business owners reluctant to use tablets and smartphones: perhaps now is the time to get aboard. NEW YORK ( MainStreet) -- Running a small business through a tablet or smartphone is quickly becoming the norm for savvy business owners. While some may have originally bought the gadgets simply for the "cool factor," users say the productivity and efficiency from the many apps available has been a welcome surprise. Small-business owners reluctant to use tablets and smartphones and their accompanying apps may find that now may be the time to get aboard. It's clear the iPad and exploding app marketplace are useful small-business tools, says Mike Pugh, vice president of marketing at j2 Global ( JCOM - Get Report). The company provides cloud-based services and tools, including mobile apps, so businesses can work more efficiently whether in an office or mobile. Why should business owners embrace mobile technology? Pugh: To be able to do more business. With instruments such as the iPad they have the flexibility to do business on their own terms. You can do product demos and take it out onto the retail floor or meet in a conference room and have a very well-designed reference of product data. You can show images, show videos, drill down to find information in real time. It gives the customer confidence that the questions can be answered well and on the spot. One of the benefits is the battery life. Many of us use computers and have been stuck in meetings where our batteries drop off. The iPad was the first nonphone to keep with them all day long knowing it would not drop off on them. And if you're going to rely upon a business tool it has to be there when you need it in order to be truly mobile. Being able to do what you want to do anywhere, anytime has value you can't envision until you do it. What about the learning curve for less tech-savvy people? Pugh: The user interface design of these new devices and the time that's put into making the app very usable bridges that gap, whether it be swiping a credit card or remotely accessing a PC or a camera to take a document and fax it. What are some good uses of mobile technology for small businesses? Pugh: Credit card processing off a mobile device is a great way to be able to do business in a variety of different settings. Using the camera in the device to be able to do both taking pictures and video. For someone who has remote offices, video conferencing can be a fantastic way to maintain contact with customers or employees. Using the camera is also great way to do documentation; essentially it serves as a scanner that can document insurance claims or for interior designers to be able to take pictures of different environments. Being able to take the picture and upload it within an app to do your job, that's the kind of thing that breaks through the barriers -- with one device and one app to make it so that almost anyone can do anything. What are a few must-have business apps? 1. Dropbox: An app for storage of everything from documents to photos to videos. Cost: Free on Apple iTunes. "There's going to be a next thing, and it's really about divorcing yourself from being stuck with one device and using any device you want. Use your PC, use your tablet, use your mobile phone," Pugh says. 2. eFax: j2 Global created this one, which is more than just sending and receiving faxes from your device. The eFax app offers a document management system complete with digital signature, large-file sharing, lifetime storage and searchable faxes, all from your iPad. Cost:Free on Apple iTunes. 3. WorldCard Mobile: The business card reader by Penpower Technology. Since networking is key for any small business, the app creates an electronic version of your business card and imports it into a contact database for on-the-spot networking. Cost: $6.99 on Apple iTunes. 5. Expensify: Doing expenses is one of those administrative tasks that most small-business owners wish they could snap their fingers and be done with. Expensify comes close to that by allowing users to track purchases as they happen, syncing the app with credit cards and bank accounts. Cost: Free on Apple iTunes. Know of an app that is super-useful to small-business owners? Tell us! Email the writer at: Laurie.Kulikowski@thestreet.com.